﻿April 25, 2016 - Portland, Oregon -- For any adult suffering from the constant disruption of joint pain, arthritis or inflammation, finding the right supplement is critical for maintaining quality of life during the healing process. Unfortunately for many, the glut of over-the-counter supplements can be impossible to sift through when trying to find the right choice, often leading to poor results for the patient. This is where DNA-Shift comes in. Available for sale on Amazon, DNA-Shift offers an organic Turmeric Curcumin supplement of 1500mg daily dosage containing turmeric root powder and curcumin extract. Turmeric is an ingredient that has been used throughout history by numerous cultures for its natural healing properties and benefits (Tze-Pin Ng et al, 2006). Curcumin, the yellow pigment found in turmeric, has strong anti-inflammatory and antioxidant properties. Today, scientific studies (Kuptniratsaikul V et al. 2009) continue to prove curcumin as one of the effective methods for increasing mobility in patients with inflammation, arthritis, or other forms of joint pain in the body. Curcumin was found to provide similar pain relief compared to a commonly prescribed anti inflammatory medication without the negative side effects such as gastritis etc. Additionally, turmeric curcumin is known for its anti-aging properties and for supporting brain and cardiovascular health (Bharat B. Aggarwa, 2009). It is no wonder that anti-aging conscious doctors recommend taking a daily turmeric curcumin supplement. This may also form part of a wellness program alongside a healthy diet of organic raw whole foods, supplements, exercise etc. That is why DNA-Shift encourages trying a natural route for joint pain relief as well as to consider taking a turmeric curcumin supplement as part of an anti-aging routine. As a DNA-shift spokesperson says, "Don't let pain and inflammation keep you from your dreams." DNA-Shift's Turmeric Curcumin 1500mg daily dosage contains 1050mg Certified Organic Turmeric, 450mg Turmeric extract standardized to 95% Curcuminoids, and has been fortified with 15mg of BioPerine® for enhanced absorption and bioavailability. Each bottle contains a 30 day supply. DNA-Shift® is a team of pro-wellness, anti-aging enthusiasts who aim to encourage others to embrace healthy life principles and lifestyles. They are committed to provide quality supplements and superior customer satisfaction. 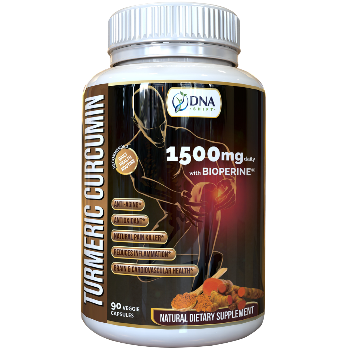 DNA-Shift® Turmeric Curcumin 1500mg with BioPerine are part of their premium supplement line. Turmeric Curcumin has been used as a spice for thousands of years in some populations. Epidemiological studies show that these cultures have a lower prevalence of certain age-related degenerative diseases.